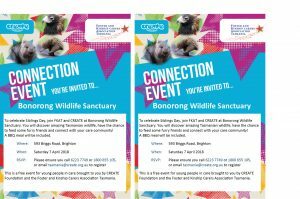 This year FKAT and CREATE thought we would celebrate National Sibling Day (recognised on 10 April) with an event at Bonorong Wildlife Sanctuary in Southern Tasmania. All welcome. Please RSVP to CREATE (see invite details) and they will be able to provide you with the timing of this event. Over 100 are attending so far.